January's special focus was the HYPNOS label. HYPNOS Recordings is a private, independent recording label based in Portland, Oregon. Though HYPNOS does not wish to restrict itself to a narrow view of the infinite possibilities of sound, for the sake of simplicity, let it be said that HYPNOS is most interested in the general areas of electronics, space/trance music, ambient minimalism, sound poetry, and sonic experimentalism. This fits in perfectly with the type of music heard on Galactic Travels. featuring the music of Robert Rich, Radio Massacre International, Wave World, Patrick Kosmos, Mind-Flux, and Pyramid Peak. The concert will take place on March 25 in the Theatre 3-in-1 in Huizen (pronounced: How-zen), The Netherlands. Eric Snelders of Quantum Productions organizes this yearly festival which has proven to be one of the most popular and largest electronic music events in the world. April's special focus was NEARfest 2000, the second annual North East Art Rock Festival featuring the music of NEARfest artists Happy the Man, Transatlantic, Il Balletto di Bronzo, Anekdoten, Par Lindh Project, Thinking Plague, Iluvitar, Nexus, D.F.A., North Star, Echolyn, and Priam. Jeff is a musician, composer, performer, sound sculptor, and visual artist who is known worldwide for his unique sound. Through a highly developed process of layering, Jeff composes and performs music rich in texture, depth, mood, and subtle detail. Using various acoustic and electronic instruments, found sounds, and extended studio techniques, Jeff sculpts sound worlds that conjure a strong sense of place, hovering somewhere between the exotic and the familiar. The Boots 80's Box contains Ron's cassette releases from the 1980s along with some rare and hard to find tracks from the 1990s. Each week's Feature CD at Midnight was one of the CDs from this fine collection on the Groove label. Craig Padilla's first encounter with electronic music was in 1986 while visiting the Schreder planetarium. During a lecture about stars, Craig noticed some of the music which turned out to be Jean-Michel Jarre's Oxygene 4. Craig had never heard this kind of electronic music before. This was the beginning of Craig Padilla's adventure into the sonic universe created by synthesizers. 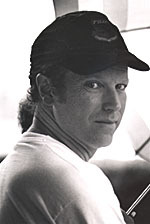 Michael Stearns is one of the originators of a new genre of music that emerged in the 1970s. This music has been described as space music, contemporary instrumental music, new age music, and electronic music, just in case you're into labels. This music's primary instrument is the synthesizer. Or, the human as synthesizer. Into his music, Michael weaves instruments and sounds from other cultures, newly developed instruments, the human voice, and the sounds of nature. E-Live 2000 took place in the Theater de Schalm in Veldhoven, the Netherlands on Sunday, September 10. Since there are only four Thursdays in September, not all of the artists will be featured at midnight (see below). But their music was played during the first hour of the program to complete the coverage of E-Live artists. Every October, Galactic Travels celebrates Oktoberfest by featuring a German band. What better band to feature than the one that created the Berlin School of electronic music? Tangerine Dream was founded in 1967 by Edgar Froese to make experimental music inspired by the work of the Surrealist painters. Tangerine Dream, in turn, has been cited as inspiration to many of the artists and bands heard on Galactic Travels. Groove Unlimited is a record label that is well represented in Galactic Travels playlists due to their fine releases. Normally, the CDs I feature are by a group or artist. But that precludes the possibility of playing compilation discs. This is the first month where I will correct this inequity. And the first four weeks comprise the group of compilations that was inspired by the X Files television series. Sequences Magazine is published in the UK by electronic music fan Mick Garlick (Mick the Ed) about four times per year. Coverage includes cosmic, experimental, synth rock, space rock, and ambient electronic music and is an essential resource for keeping up with music heard on Galactic Travels.